Native advertising has outpaced display in Indonesia, with brands now allocating the bulk of their digital marketing budgets on native ads, GetCRAFT finds in its Indonesia Native Advertising and Influencer Marketing Report 2018. The report reveals that brands earmark 20-30% of their total media budgets to native advertising. Juxtaposed with findings in the Indonesia Digital and Content Marketing Report 2017 that digital comprises around a third of media spend, this new data indicates that native advertising now takes the lion’s share of the digital budget. The Indonesia Native Advertising and Influencer Marketing Report 2018 also shows that influencers expect their income to grow by at least two times to as much as five times next year. Publishers, for their part, project that more than half of their revenues will come from native ads. Brands’ median native ads spend will be unchanged next year, but more of them are looking to prioritize native ads. The portion of brands that plan to spend more than half of their budgets on native will spike to 16% in 2018, up from 9% this year. 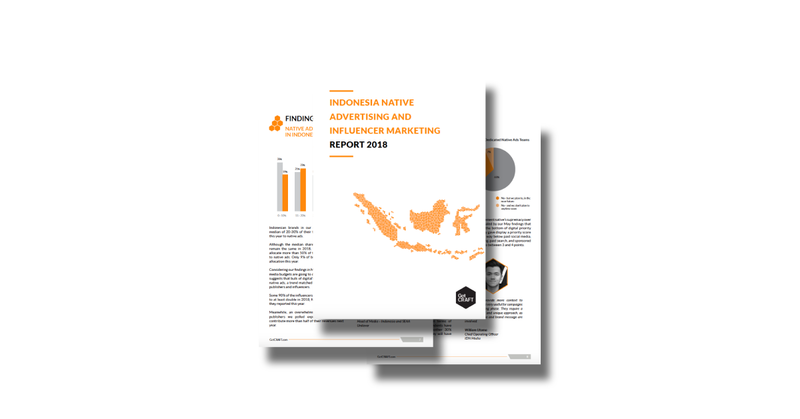 The Indonesia Native Advertising and Influencer Marketing Report 2018 is based on the results of three separate surveys sent to 100 brands and agencies, publishers, and influencers, and insights from email interviews with industry experts.